Recently we updated the membership regarding Court Funding. The state budget covers every aspect of California Government including the Judicial Branch. In his budget Gov. Newson included additional funding to the Court system. This is positive. However, the budget again does not go far enough to truly alleviate the decade of budget austerity faced by the Judicial Branch. Recall that the budget is first presented by the Governor in January each year. This budget is revised in May by the Governor, based on more recent and accurate financial information and negotiations with the legislature. A final budget must be adopted by June 15. Once the budget is final, the Trial Court Budget Advisory Committee (a committee of the Judicial Council, the Judicial Branch of government led by the Chief Justice) reviews the trial court portion of the budget and makes recommendations to the Judicial Council on the allocations among the 58 trial courts for the coming year. 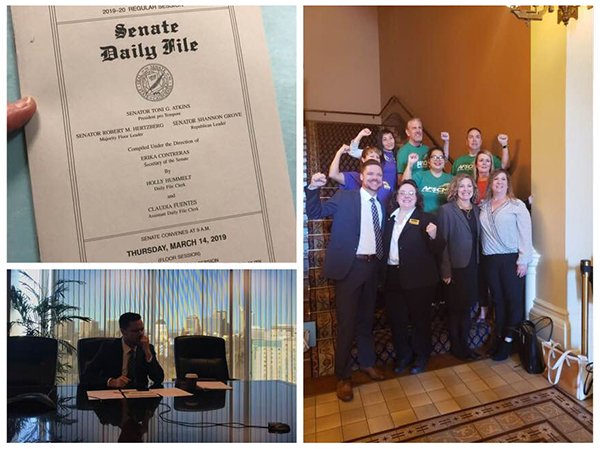 A group of OCEA members went to Sacramento in January to educate the Orange County legislative delegation (the members of the Assembly and Senate who represent Orange County) about the issues that front-line Orange County court workers have faced as a result of years of underfunding. As part of this effort we asked each member of the Orange County’s legislative delegation to sign a letter to the leadership of the California Legislature supporting our request for additional funding to the Court system. We are happy to report that every member of the Assembly from Orange County has signed the letter. Orange County elected officials, regardless of their party affiliation, signed the letter supporting additional funding for Orange County Courts. A very special thank you to Assemblywoman Sharon Quirk-Silva for leading the efforts! We expect a similar result in the Senate shortly! On March 14 California Senate Budget Committee #5 met. This sub-committee oversees the Judicial Branch and will make recommendations to the rest of the State Senate regarding Judicial Branch Funding. OCEA President and Court Clerk Lezlee Neebe was joined by OCEA staff members Tim Steed and Michelle Rubio at this hearing to provide testimony to the committee about the need for additional Court funding. Our ask was that an additional $110 million dollars be allocated to the 58 trial courts for relief to staff by funding the hiring of additional staff and raises for current staff. This request was echoed by the other unions representing Court workers throughout the state. Unions representing a vast majority of the front-line workers were present to show solidarity for one another and speak to the struggles of front-line service providers.We will head to Sacramento again on March 25 for a hearing of the Assembly Budget sub-committee on the Judicial Branch. OCEA members and staff will again join our allies from around the state to advocate for more funding to the Judicial branch so we can provide relief to staff and begin to make up for a decade of underfunding. It has become apparent in the previous months that workers are the ONLY ones who are pushing hard to have additional funding help front-line workers. Representatives from the Judicial Council seemed out of touch with the plight of Court workers, instead emphasizing the need for more technology and other “innovative” panaceas that have caused more problems than they have solved. In addition to the tone deaf testimony of the Judicial Council representatives, we were also disappointed that no representatives from Orange County Court management were present to advocate for additional funding. The message is clear—if we want change we must be the ones to fight for it. From today until the budget process is complete it is our job to stand together to fight for all funding we can get. We will continue to advocate throughout the Spring and into the Summer so Orange County Court workers can receive the funding we so desperately deserve. If you want to help with our efforts here in Orange County or in Sacramento, please let us know by going to www.ocea.org/getinvolved.